My dog, Barney, has has dry skin and flakes with a persistent wet dog smell — even after bathing. I supplement fish oil (4 capsules a day). Hair is growing in well (had some hair loss coming out of the shelter). Seems to be mildly itchy, no hot spots just dry and odorous. Barney is a pointer, shepherd mix 9 mos old. What do you think? Also, he eats no beef, corn, wheat, or preservatives — good food. Any suggestions? I’m sure Ron is not alone in searching for the best dog odor remedies that will remove smelly dog odors once and for all. So I thought I’d share my best tips here for all dog owners who are dealing with the same thing: lingering dog odor! If you have personal experience with dog odor even after a bath, feel free to pitch in with your own ideas and recommendations as well. Ron, it sounds like you’re doing the right thing as far as what you’re feeding Barney! Higher-quality foods mean a healthier dog on the inside. Plus, better foods help to alleviate the bad breath that many dogs typically have. Unfortunately, some dogs are just a little drier and smellier than other dogs — skin issues and coat issues vary from dog to dog — and you may need to try some more effective dog odor removers. Here’s a good explanation of natural dog odors vs. unnatural dog odors. The fish oil usually works great at preventing dry skin, among other things. But I’m wondering if the 4 caplets you’re giving might be too much. Perhaps that’s what’s causing the excessive dog odor? I don’t know this for sure, it’s just one theory worth exploring. Have you tried olive oil in your dog’s food? That would also help to clear up any remaining dry skin issues. It worked well for our dog — and you can see in the comments to that article that olive oil has worked for many other dog owners as well. Also, be sure to keep your dog’s coat well-brushed — but don’t overdo it. I know firsthand that it’s easy to get carried away sometimes. For example, the Furminator is my all-time favorite dog brush. It works especially well with dogs that have an undercoat. Brushing with the Furminator is pretty much effortless, and my dog always begs me to continue brushing him longer — he likes it that much! But brushing too frequently (or too hard) can make dry skin problems worse. A dog needs just enough brushing to remove the loose, dry hair. 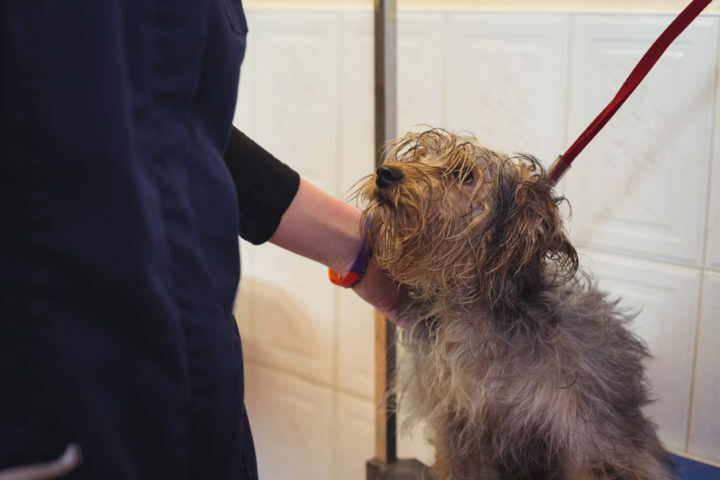 Too much brushing exposes the skin to air all the time, which leads to even more dry skin and prevents the dog’s own body oils from keeping his coat healthy. Just the same… bathing your dog too often can lead to dry skin as well. Too many baths will remove the natural protective oils from your dog’s skin — making it flaky, irritated, and itchy. Bathing your dog every 3 months is what most veterinarians recommend. A cheap home remedy for dog odor would be to pat your dog’s fur with baking soda. Baking soda absorbs odors quite well and doesn’t have any harmful ingredients in it. Or, you could try what works to remove skunk smell from dogs! Skunk dog odor remedies are extra-strong and should be extra-effective. I’ve tried a few of the dog deodorizing sprays in the past. But my favorite is actually a waterless shampoo that I use as a dog odor eliminator on occasion — since no rinsing is required. To help with the dog smell immediately after bathing, I think the best dog shampoo for odor is an aromatherapy-based dog shampoo. Here’s the one I use. That company is out of business now, but you can find similar ones available these days. Dog aromatherapy shampoos are available at most bigger pet stores (and possibly in a Whole Foods store’s pet section or body section). There are also citrus-based dog shampoos. Citrus is known for being a good dog deodorizer. I once bought a gallon-size jug of citrus dog shampoo from a pet store. It worked very well, but the scents in the dog aromatherapy shampoos are my favorite. Well, that’s about the extent of my knowledge on dog odor — based on personal experience with my own stinky dog.